(1) It’s much more dangerous than riding in a car. 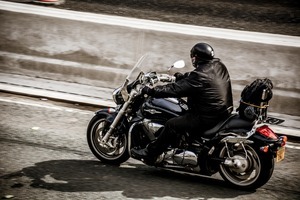 NHTSA says that motorcyclists were 29 times more likely than car occupants to die in a crash. (2) Wearing a helmet can save your life. 40% of motorcyclists killed in crashes were not wearing a helmet. Unbelievably, only 19 states require all motorcyclists to wear helmets, while three states-Illinois, Iowa and New Hampshire-have no helmet use laws at all. (3) Older riders are in greater danger. 54% of motorcyclists killed in crashes were age 40 or older, and older riders sustain more serious injuries from crashes. This is likely attributable to declining vision and reaction time in older riders, and to their increased fragility, as well as to the larger bikes they prefer to ride-which are prone to rolling over more often. (4) Anti-lock brakes (ABS) are a great safety feature. Motorcycles with ABS are 37% less likely to be involved in a fatal crash. (5) Don’t drink and ride, especially at night: 27% of motorcyclists killed in a crash had blood alcohol concentrations (BAC) above 0.08—nearly three fourths of them being 35 to 49 years old. Night time motorcycle fatalities are three times more likely than day time fatalities to involve high BAC levels. (6) Don’t speed. 33% of motorcycle crash fatalities involved speeding. (7) Don’t let anyone ride without a license: An incredible 27% of those motorcyclists killed in a crash did not have a valid license. (8) “Super sport” motorcycles are really dangerous: The riders of “super sport” motorcycles-which are marketed to young riders, and able to reach street speeds up to 190 mph-are four times more likely to die in a crash than the riders of other types of motorcycles. So, unsurprisingly, driving a motorcycle is dangerous for the same reasons that driving a car is dangerous: excessively fast and/or unprotected and/or impaired driving, especially by someone whose reflexes are not up to the demands of driving, is dangerous. The difference is the margin for error: the motorcyclist has so much less protection surrounding him/her, and therefore has far less chance to survive a crash, than the driver of a car.